If you were looking for a film about paper planes then you’re now in luck, the new Australian film Paper Planes is exactly as it says in the title – a young boy from the outback of Australia discovers his talent for constructing paper planes and throwing them at record-breaking distances, so he embarks on the sport’s competition throughout Australia and then Japan, meeting young competitors along the way. 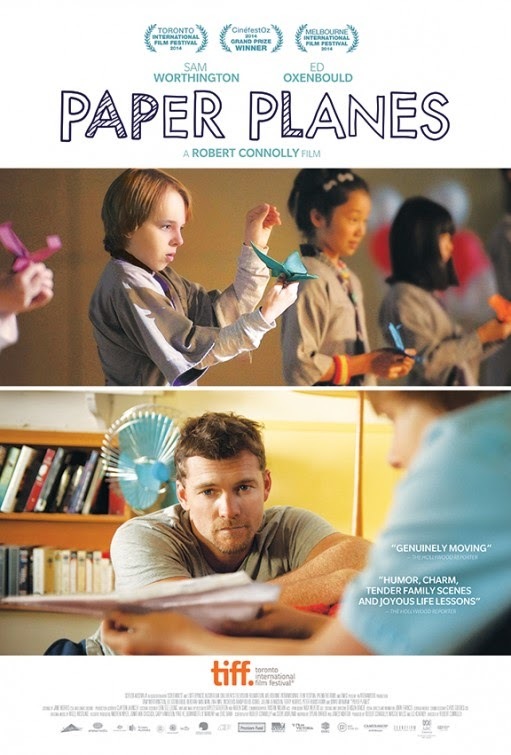 Of course, the film is only about paper planes on the surface, it is really about the nature of competition, pursuing opportunities, making friendships, reacting to bullying, and overcoming loss. A number of the acting (from young and old) is suspicious, but Ed Oxenbould is impressive as the young boy, Dylan, who discovers a talent and passion for paper-plane competing, so he indulges in his passion, met with mixed reactions (and mixed quality of acting) from his single dad, Jack (Sam Worthington). A number of familiar faces pop up as Dylan encounters new people in this exciting, yet grounded, journey such as Deborah Mailman (The Sapphires) and David Wenham (300). Most of the intentions behind this film seem noble, but it doesn’t mask some of the flaws that stick out like the pointy end of a paper plane. I would say there’s some problems with the characterisation, but that would imply that there’s been a transition in the characters – some of the bully characters suddenly become friendly with what seems like little motivation or reason (other than it’s the right thing to do). For a film with an original concept, the paths the characters and story take are hardly original themselves. Yet for all of Paper Planes easy manoeuvres and simplicity, it works. It’s sometimes funny when it wants to be and it’s sometimes dramatic when it wants to, with the typical sombre moment that takes place before the film’s climax scene coming across as clichéd as it is effectively moving. This is a calm, but enjoyable film for kids that unlike its digimation contemporaries doesn’t assault the viewer with non-stop colour, sound, and fury. I can’t say it was something that’s going to stick and resonate with me deeply, but it was fun to see this original idea turned into an Australian film with a near persistent pleasure throughout and an air-tight moral compass. I guarantee you if you take your kids to see this, your house will be full of airborne paper planes for months to come.